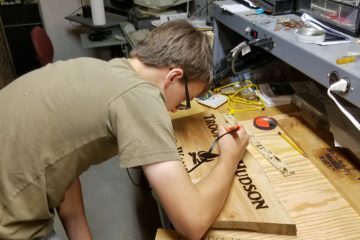 First Class Scout Colin works hard on a plaque he hopes to have ready for summer camp. The board came from a huge pile of wood the troop split at the Apache campsite last year. After a number of passes through the planer it is ready to be crafted into a more permanent and decorative sign.